After a mercury spillage, or when just dealing with mercury-rich waste, it is essential that the storage container is suitable. Our range of containers provides safe containment for short or long term storage using leakproof, shatterproof bottles. Large containers are fitted with a mercury vapour suppressant system. Use these for amalgam waste, industrial waste, reclaimed mercury from decommissioned equipment. Amalgam Collection Kit All you need for quick, safe and easy collection, storage and disposal of mercury-rich waste in the dental surgery. Use it to remove and collect amalgam waste from the suction trap and other sources. The waste is stored under a mercury vapour suppressant solution in a shatter proof, leakproof 500ml container for disposal when full. Supplied with a brush .. Legislation around the safe storage and disposal of mercury waste is changing and some carriers prefer a UN-Certified waste container. We have sourced these sturdy HDPE UN-Certified containers and added a mercury vapour suppressant which is is activated by the addition of water. 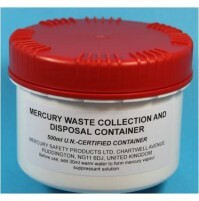 This container has a capacity of 1 litre and fully meets UN requirements for mercury waste. It include.. Legislation around the safe storage and disposal of mercury waste is changing and UN Certified containers are often required for transport of waste. We have sourced these sturdy HDPE containers and add a mercury vapour suppressant which is activated by the addition of water. The container is 500ml (half litre) capacity and includes a sealing cap held in place by the sturdy outer cap. .. 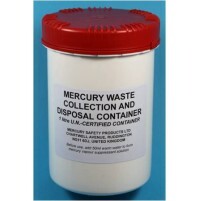 Waste containers x10 Pack of 10 waste containers for replenishment or replacement in larger numbers of hospital type mercury spillage kits, usually in the hospital or industry setting. The waste containers will hold 250ml and are made from high density polyethylene (HDPE) with a machined rim and sealing ring. They are leakproof and shatterproof; HDPE is impermeable to ..